As this issue of Siesta Sand was being published, the engineer for the City of Sarasota was expecting the Florida Department of Environmental Protection (FDEP) to issue its formal Notice to Proceed at any time for an emergency beach renourishment project on Lido Key Beach. During an Aug. 6 segment on ABC7 in Sarasota, City Engineer Alexandrea DavisShaw said the plan is to use about 185,000 cubic yards of sediment from New Pass. The latest materials the city has submitted to FDEP say 222,500 cubic yards of sand is available in the New Pass borrow area. According to spokesman Jason Bartolone the city already has the permit for the emergency project. 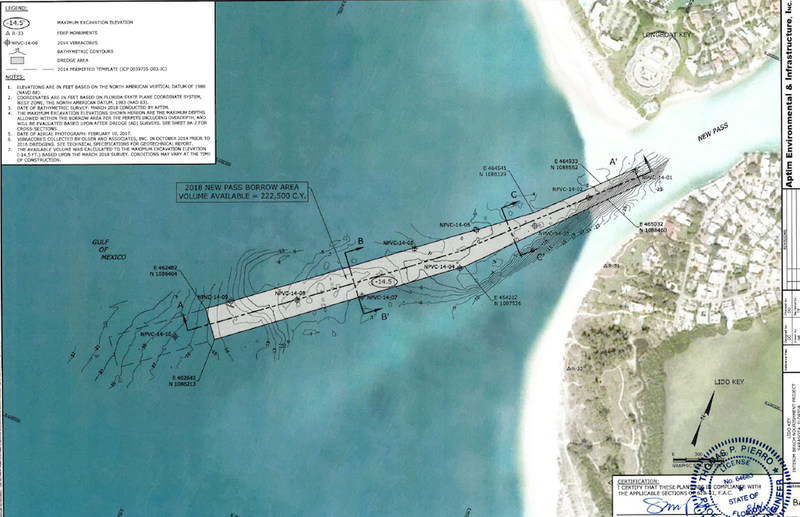 The city alternates with the Town of Longboat Key in using sand from New Pass for renourishment initiatives. The city applied to the Federal Emergency Management Agency (FEMA) to undertake this latest effort so it can repair damage inflicted on Lido by Hurricane Hermine in 2016 and Hurricane Irma in 2017, according to a July 10 letter to DavisShaw from Thomas P. Pierro, director of operations for the Boca Raton firm APTIM — the city’s consultant for the emergency project. He was providing responses to a Request for Additional Information from FDEP, which the city received on June 29. Pierro pointed out that the renourishment would take place along the central and southern portions of Lido’s shoreline. The FDEP permit the city will use for the initiative was issued on July 2, 2015 and is valid until July 2, 2030, Pierro added. However, two representatives of the Siesta Key Association have questioned how FDEP can allow the project to proceed, because no inlet management plan was completed after the city’s removal of sand from New Pass in 2014. In correspondence with FDEP staff, Robert Luckner, a member of the nonprofit organization’s Environmental Committee, has pointed out that the plan was a provision of the permit for that prior project. Bartolone, the city communications specialist, wrote in his Aug. 7 email to that the city would defer to FDEP any comment on Luckner’s points. FDEP did not respond to requests for comments about Luckner’s emails to the department. “[T]he City will maximize the economy of scale with an estimated volume of 175,000 cubic yards dredged form New Pass and placed on Lido Key,” Pierro wrote. “A truck haul of equal quantity at $70 per cubic yard would exceed $12,000,000 and be cost prohibitive,” he added. “The Project is eligible for FEMA funding and is authorized under current state and federal permits,” Pierro concluded the letter.